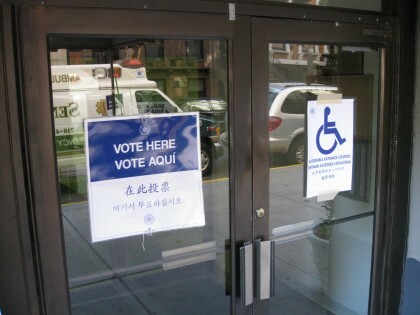 New Yorkers will be voting for Mayor, Public Advocate, Comptroller on Tuesday (11/5). In Brooklyn Heights, we will also be voting for Brooklyn Borough President, D33 City Council among others. DECIDENYC offers a comprehensive look at the major races. Sample ballot and polling place locator are below. All three electronic machines weren’t working at Borough Hall as of 7am. Anyone know if they were running later in the day? I’m sure my vote will be counted — just shows that the old clunky machines work just fine! The machines were working okay when I got there at 9am, though things felt a little dysfunctional there in general. The room is way too crowded for the amount of traffic they’re dealing with and the lines cross around each other in a confusing way. Luckily, the crowd there was pretty civilized and we got through it all. at 9:30 a.m. the scanners in Boro Hall were not working. I was told to put my ballot in the emergency paper ballot slot. Who knows whatever happened to it? I was there at 7:30 AM. None of the machines were working (error messages on all the screens). I too had use the emergency ballot slot. I wrote the Attorney General’s office to complain ( civil.rights@ag.ny.gov ). Agree with you — felt like I just submitted my vote for nothing.